The three cars- including my own- that didn't comply with the EMC car colour scheme of silver all arrived late enough to have to plump for the less convenient parking spots at Mill Cottage, being more than 6 steps from the front door. 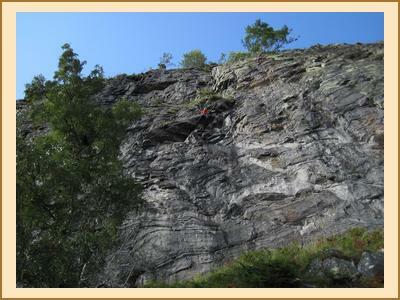 On Saturday a large group of climbers headed to Huntly's Cave near Grantown-on-Spey. Named after the hiding place of a 17th Century Marquis it also proved a decent place for climbers to hide from rain showers; by a couple of accounts it was a trifle chilly and damp although everyone got some climbs in. Even Chris was impressed by Katrina's affinity to cake afterwards; they opted to walk off their snack with a trip up Meall a Buachaille, returning late to the cottage. Fiona R and Mike attempted to bag the various tops of Sgurr Gaoith with Sara and new member Phillip?- a route of 31km+ which was cut a tad short when they realised just how far away the one near Braeriach looked in a rain shower. A tactical move by Mike meant that as there were two committee members on that walk, in absentia I had inherited meet reporting duties from Tim. Again. Antti and I cycled up at least some of Mullach Clach a Blair (admittedly mostly pushing) and were rewarded by a descent which took around 10 minutes. We extended our return route along the eastern side of Glen Feshie, enjoying a sighting of a hen harrier and a cuppa in Rothiemurchus. Neither of us emerged unscathed as Antti lost a bit of tooth to a Haribo and I sustained pathetic injuries falling off my bike whilst admiring the view at Loch an Eilein. A large group consisting of Fiona C (who had accompanied Antti and I up the west side of Glen Feshie on her hybrid bike), Kate, Adam, Gillian, Margaret and Alan H plodded up a remote Corbett?- Leathad an Taobhain - and Fiona must have felt smug waving over her shoulder at the rest of the group when collecting her bike for the ride back to the cottage. Adam had some impressive blisters to show for the walk. Kenny Salmond and Martin Darling (!) emptied the room with their indyref debate in the evening, with an almost unanimous "Yes" in favour of Finnish berry vodka in the kitchen. Mill Cottage was clean, warm and it was great to be able to accommodate campers in the field behind the hut. The smoke alarms work perfectly. The Alpine bunk downstairs was so comfortable that Alison's nightmare went largely unnoticed, and she was lulled back to sleep by the dawn snorus. On Sunday Fiona R, Alison and Mike met up with Fiona M at Creag Dubh and had a good day climbing classic routes. Katrina and Chris cycled up to Lochan na h-Earba and did a 5-pitch climb on Ardverikie Wall (hard-severe) and got midged on the top pitch. They fled to the top of Binnein Shuas to bag Katrina's first Graham. And there was more cake. Most of the remaining crew (Kate meanwhile headed toward Bynack More) went for Coire an t-Sneachta: Martin, Keith and Kenny tackled a climb on Mess of Potage, others scrambled up the Fiacaill Ridge. 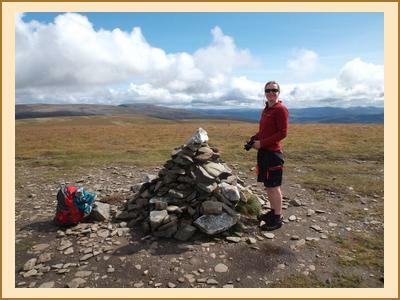 Alan H, Antti and I made more-or-less directly for Cairn Gorm and the return; Sara, Adam "no-blisters-can-stop-me", Phillip, Fiona C, Gillian and Margaret ambled across the plateau to Ben MacDui. Fiona, Gillian and Margaret stayed one more night at the cottage, taking advantage of the English bank holiday and shouldering all responsibility for the club's excellent reputation for cleanliness. In a nod to the August 2012 meet in Glen Feshie the weather was on the whole kind and the views were rather fetching.